Excel files can easily and quickly be converted to txt, html, csv, mdb, dbf, etc. Since the application is stand alone, Microsoft Excel is not required to be installed. The interface is clean and offers powerful flexibility. Instead of locating files via the Windows Explorer approach, files can be selected within Remote File Converter from the directory folder tree menu. Files matching the filter specified by this method return the file names relating to a specific selection criteria, allowing a wide range of flexibility for batch converting of files. 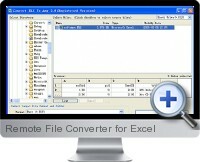 Remote File Converter for Excel is an enterprise edition application.